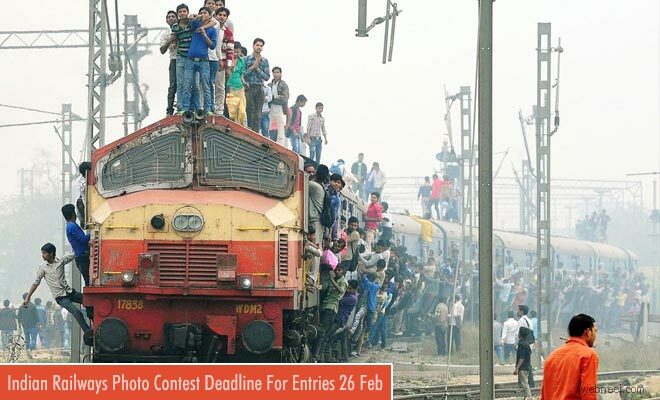 Photography Contest : Indian Railways is a conducting a photography contest to capture the beauty of Indian Railways. This is one of a kind initiative taken by the ministry of railways to stir the passion of the young photographers in India. Participants should submit their photographs in the MyGov website and the pictures should not exceed 2MB. The acceptable minimum resolution is 300 dpi and the format can be in JPG or JPEG. Three winners will be selected and they will be eligible for cash prizes, certificates and a two Free 3A tickets for the award ceremony. Pictures taken on the footboard of the train will not be accepted. The deadline for submitting the photographs is 26th February 2018,17:00hrs. The photographs can be captured using any kind of camera, including mobile camera. The winners will be declared within 28 days from this date either through email or by way of announcing their names on the MyGov blog page.